At Monday’s work session, from left are Mayor Konopa and Councilors Collins, Olsen, Kopczynski, Coburn, Kellum and Johnson. If the Albany City Council wants once again to wade into the thicket of marijuana regulation, it can do so under Oregon laws passed this year. Among other things it could ban the sale of recreational marijuana, but the ban would have to be submitted to the voters in the 2016 general election. Sean Kidd gives the council the details of Oregon marijuana law. 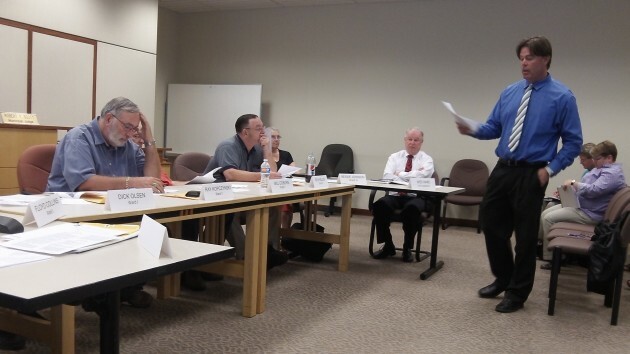 Assistant City Attorney Sean Kidd gave the council a 10-page rundown Monday of the ins and outs of marijuana law as changed by the 2015 legislature following the passage of Measure 91, which legalized recreational pot. The law is full of wrinkles, and council members said they wanted to study Kidd’s list before deciding whether to attempt any new city regulation. Albany now has five medical marijuana dispensaries, according to Mayor Sharon Konopa. Asked by Councilor Ray Kopczynski whether this has had an effect on crime, police Capt. Jeff Hinrichs said he was not aware of anything linked to the dispensaries. 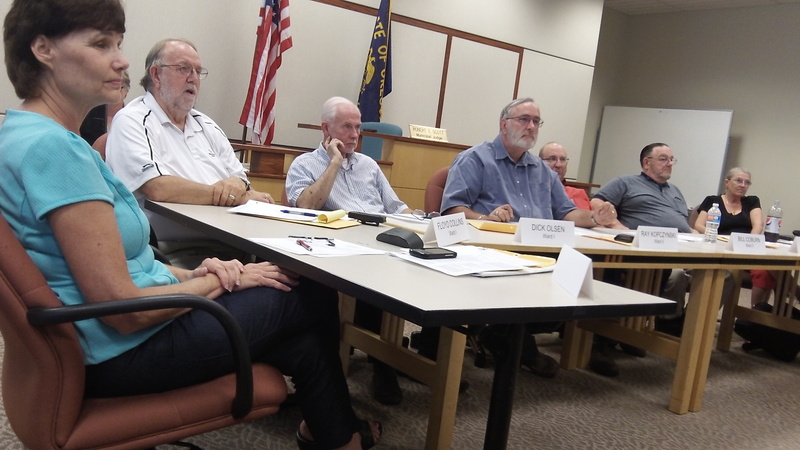 The Albany council is prohibited from banning marijuana facilities on its own because Linn and Benton counties did not vote against Measure 91, the legalization initiative last fall, by 55 percent or more. Linn’s vote against the measure was 52 percent, and Benton supported it with 60 percent. But if Albany passes a ban on facilities and refers it to the voters, as allowed, this would amount to a moratorium and the state would not issue new retail or dispensary licenses until the voters had spoken in November 2016. Existing medical pot dispensaries would be grandfathered if the council adopts a ban on marijuana facilities. A ban, though, would mean Albany would get none of the revenue from the state’s 17 percent recreational marijuana tax. As for other taxes, unless it imposes a ban, Albany could also impose a 3 percent tax on sales of marijuana items — but not medical pot — if the voters agree at the next general election. The city’s existing 10 percent pot tax, passed before the 2014 election, appears to be dead. Medical dispensaries, by the way, can sell recreational pot from this Oct. 1 to Jan. 3, when licensed retailers presumably take over, and during that period sales will be untaxed. By “grow sites” are you referring to an individuals ability to grow their own within the city limits without a OMMP card? Or commercial grow sites….?? “Q: Where and when can I buy marijuana? It is hard for me to take this council seriously. So which intoxicant is more dangerous to society, pot or alcohol? It’s not even close – alcohol. This risk should be reflected in local public policy. But it isn’t. In fact, our council gave thousands of dollars to help start up a local distillery/brewery (Albany Steamworks). And the council routinely grants liquor licenses to local retailers and food establishments. And now some on the council want to put up roadblocks to an alternative, less dangerous, intoxicant? City government should just get out of the way. It shouldn’t spend public money to push, nor impose public policy to block, my preferred intoxicant. I’m perfectly capable of making my own choices. I agree 100% — and have voted so since we worked through the process to allow medical marijuana facilities inside the city limits (of which there are now 5). Common ground. I like it. Now I need to do a better job convincing you that CARA is equally unjust. I will never stop trying to change your mind. Hopefully our future jousting will knock off your blinders. Amen, Ray. On this we agree. Pot sales & their curtailment…my gawd contributors, when I first joined APD in 1971 Albany was awash in POT! It was as common on the subjects I dealt with as dandelions in lawns! Very little have I seen in a scaling back the liquor sales! Now there is a move to allow “hard” liquor sales in grocery stores!!! Our council doesn’t turn back any OLCC revenue! It seems crazy to me that they would kick that tax revenue to the curb … the revenue that could pave these POT holes they call streets in this dear city we call home. Citizens have spoken. The law passed. Why does the City Council think they can interfere with the majority of people that voted them into office? Probably not a good idea at re-election time. BTW I work for an employer that follows Federal laws that reflect marijuana as illegal. they follow D.O.T. random drug testing guidelines. I have no dog in this fight. I would be foolish to risk my job for whatever marijuana has to offer.